The moment when the final printed proof of your book is in your hands is pretty special. The months of effort to revise and expand the material, researching and writing the new chapters, the multiple revisions, the back and forth with designer and editor . . . it all becomes worth it when the finished product arrives. A trip to the post office this morning brought the page proofs for the 2nd edition of The 8 Essential Skills for Supervisors & Managers nicely bound in its new cover. The new chapters and additional information brings the page count to more than 420. There is still more to do, of course. There’s the final review with my editor, Jan Andersen of Beyond Words, Inc., getting the word out to previous purchasers and organizations who adopted the 1st edition for their management development programs, marketing and promotion, as well as the upcoming eCourse. Savoring the moment is wonderful. Now, back to work. My recent post (Out of the Blue!) mentioned the adoption of “The 8 Essential Skills” by a large international law firm. As the sequence of orders (50, then 350, then 70 more) occured, we were initially focused on getting the books produced and making sure they were delivered on a timely basis. Fortunately, we had selected CreateSpace to produce our book “on demand” and that is what they do, and do well. Based on previous orders, my level of confidence about their capabilities was fairly high. Their track record was quite good with the few gliches we’d experienced in the past having been well-handled. The turnaround time from placing the order until the cartons showing up on the client’s loading dock was typcially about 10 days; pretty incredible. How were they planning to use the book? How did the firm “find” the book? My second question – how did they come to select this book? After all, there are hundreds, even thousands of other books on supervising and managing available. The answer was an indicator of how carefully this firm went about designing their program. First, they convened a task force and charged them with examining a wide variety of resources – materials that could be used in central and supplemental roles in their year-plus development program. Then the group compared what they found. One of the members downloaded the Kindle version of “8 Essential Skills”, liked it and showed it to several colleagues. Then, they ordered the printed version for task force members, who evaluated it individually. After aligning the Skills with their core competencies, they ordered copies for their 450+ supervisors and managers. That’s the kind of vetting process we think makes great sense, and I’m delighted to see the “8 Essential Skills” get such a thorough validation. The firm kicked off their management development program this week. As you would expect, I’m looking forward to learning how that process went. Stay tuned! Your exact mix may be somewhat different than mine, but the simple fact is we spend a huge portion of our day communicating. Perhaps you are a great communicator; one of those people who has an innate talent for communicating with your coworkers and customers. I’ve actually met a few, but very few if I’m honest about it. As a very clear Extravert, I’ve had to work diligently at my Listening skills. Others need help to improve their Writing skills. Still others break out in a cold sweat at the thought of gettiing up and speaking to a group, which is something I am good at and enjoy. Every one of us communicates a lot and yet very few of us are great at all aspects of communciation. What do you need to work on? What portion of your communication is less effective than it could be or should be? Writing The 8 Essential Skills was certainly an adventure. Producing and promoting the book is turning out to be another adventure. Colleague, coach, and friend Mary Jo Asmus recently interviewed me about the book and posted portions of the interview on her blog. Wally Bock, who writes the always-interesting Three Star Leadership blog, is a regular reader of Mary Jo’s writings, spotted the reference and requested a review copy. Now we’ll see what Wally thinks. Regardless of your purpose, you want to create, transmit, and receive information as effectively as possible. At the same time, you want to build understanding and enhance your working relationships. And if you are unable to get your ideas and expectations across clearly, you are not going to be successful as a manager. What do you think is involved in effective communication – Communicating for Results? 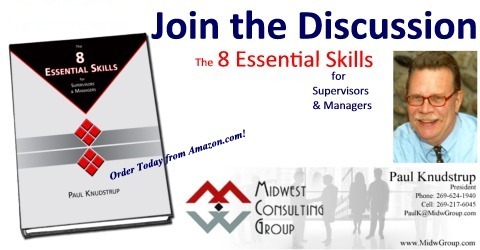 A large regional bank with a major presence in SW Michigan ordered quite a few copies of The 8 Essential Skills – seems they want to help their already great management team kick it up a notch or two. Quality people recognize quality ideas! Yea! Order at least 100 copies of The 8 Essential Skills directly from us at MCG Press and receive a discount. We’ll have your order printed, bound, and on its way to you in just a few days, and shipping is free. Placing your order is easy – just E-mail me at PaulK@MidwGroup.com. Let us know you saw this blog post and receive a bonus gift! What a great way to help your entire management team improve and grow together!